So now that I’ve soldiered through the prequels again, it’s finally time for the light at the end of the tunnel: the original trilogy. I don’t see any reason to waste more time, so let’s get right to it, shall we? You say the words “Star Wars,” and more often than not, it’ll conjure up giddy, nostalgic childhood memories for most people. Just like the majority of the world’s population, I watched Star Wars as a kid. But curiously, the film never really had much of a lasting impact on me at a young age, to the point where up until now, it was at least a decade since I’d last watched the movie in full. Before you overreact, though, don’t take that to mean that I dislike the movie; nothing could be further from the truth. It’s just that after having finally re-watched it again, I at last have a much fuller appreciation for it than I ever did, and I can recognize its status as not only the turning point for big Hollywood blockbusters, but as one of the biggest achievements in the genre in general. Really…what is there to say about Star Wars that hasn’t already been said? Well, let me just focus on the things about it that stood out to me this time instead of trying to hit all the general points. First of all, the pacing and story structure of the film is extremely tight, and it never feels like there’s a wasted or unnecessary scene in the entire film. It gives you all the information you need to know and then doesn’t waste any time getting into the heart and adventure of the story. Perhaps the film’s biggest strength is its reliance on characterization rather than dialogue to develop its characters. I was initially thrown off a little by this, but the more the movie sat with me, the more I realized how much of a good thing that is. Rather than explaining to us who these characters are, George Lucas SHOWS us, and that’s much more efficient. The best thing about Star Wars, though, is its simplicity. The plot isn’t overcomplicated a all, but it doesn’t need to be. All it needs to be is an adventure in space, and it succeeds greatly at being that, and because of its simplicity, we’re able to get into the characters and universe very easily. Plus, there’s that constant sense that there’s more to this world/universe than we’re seeing, and that enhances the sense of wonder and mysticism that’s present when characters talk about The Force and Jedis. 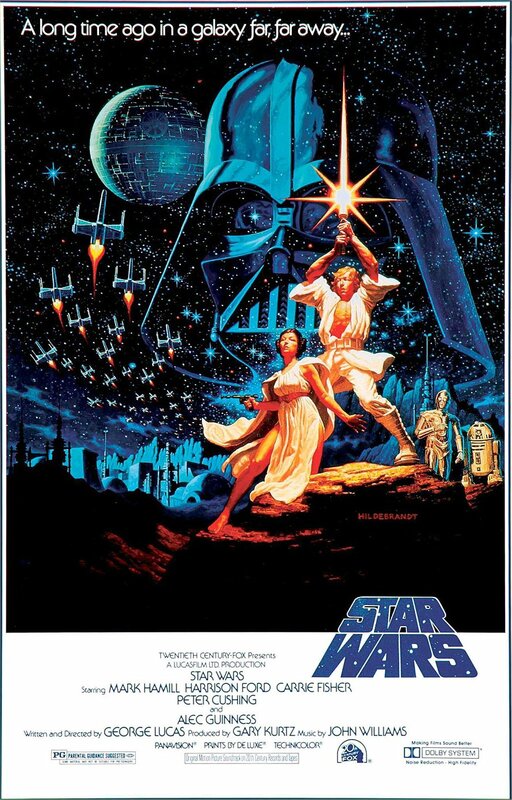 Star Wars, to me, is executed just as well as other earlier blockbusters such as Jaws and Raiders of the Lost Ark. The one thing they all have in common is that they showcase a mindset of not undervaluing how a simplistic story can invite the best kind of thrills and excitement, and Star Wars has those in spades. There are a handful of sequels from the 80’s/early 90’s that are commonly regarded as the best of their respective franchises. Aliens and Terminator 2: Judgment Day are two of them, but also included in that group is Star Wars Episode V: The Empire Strikes Back. For me personally, there seems to be a curious, common pattern amongst all those sequels: while I most certainly like them a lot and think they are all strong movies in their own right, I wouldn’t consider them the best of their franchises, and the same rings true for The Empire Strikes Back, no matter how hard I try with it. Now, before any of you impale me with your lightsabers, hear me out. First of all, like many, I admire Empire‘s turn to a decidedly darker tone which allows the filmmakers to explore the characters in a deeper fashion than the first film. That shift makes sense, given the progression of the plot and what’s happening throughout this one. I also like the furthering of the mythology of this world where Jedis and The Force are concerned. As with the character development, it gives us a bit more to chew on. We also see a bit more of this whole universe, with a few different planets — each of them unique in design — serving as significant locations. And, of course, there’s an oppressive sense of danger present throughout the film. The performances from the main cast are all captivating as well. So, then, what is it that keeps me from calling The Empire Strikes Back a great film? If I had to put my finger on it — and, believe me, I’ve given this a lot of thought — it’s that while I can admire the film’s desire to treat the material more seriously this time around, the movie is never able to fully hook me emotionally to the degree where I feel truly invested in it and the consequences story from minute to minute. If I had more of a deeper love of the franchise and the characters than I do, then perhaps things would be different. But as it stands, Star Wars has never held much of a place in my heart as something like, for instance, Harry Potter. Consequently, while The Empire Strikes Back still manages to have a hold on me as I watch it, there’s another part of me that’s just waiting around for all the major events to happen. There are many other films I can think of where even though I’ve seen them many times and know what’s coming, I’m still deeply involved in them because I’m either so invested in the world, the characters, or both. But not with this. Also, that other part of me questions if a Star Wars movie needed to go this dark, because the original still manages to be captivating without going with a more oppressive tone. In many ways, I actually prefer the simplicity of the first Star Wars film. In the back of your minds, many of you are probably thinking that I actually dislike the film simply because I’m not giving it a perfect rating. Nothing is further from the truth. When I sit down to watch a movie with endless praise like this, naturally, I expect to be wowed. But if it doesn’t manage to do that, then I have to call out any problems I have. Come to think of it, I don’t think this was EVER my favorite of the Star Wars films. I think The Empire Strikes Back is a very good film with a whole lot of merit, just not a great one. So, I’ll just come right out and say it: I love Return of the Jedi. If you had asked me right after I re-watched it, I would’ve even gone so far as to say it was my favorite of the trilogy, but a little bit of reflection gives the edge to Star Wars instead. That doesn’t diminish my opinion of this film in any way, though. However, I’m just a little disappointed to hear that this is apparently not well-regarded among even Star Wars fans in general. It’s The Ewoks and the plot structure that bother people about this movie, but I’m here to say neither of those things bother me about it. The Ewoks may seem overly cutesy, but underneath that fluffy exterior, they’re pretty capable and resourceful — and they’re in no way annoying to the degree of certain characters in the prequel trilogy, let’s be honest. And for those saying it’s problematic that The Ewoks are able to take down a bunch of Stormtroopers during the climax, need I remind you that they had the tactical assistance of Han Solo, Princess Leia and a bunch of other Republic fighters to help them accomplish that? As for the issue of the film mirroring the basic plot of the first film…again, I don’t care, because this movie executes very well and the flow of the film is incredibly smooth to the point where the running time just flies by. My main issue with the movie is just that the first act in Jabba’s Palace could be trimmed down slightly. Return of the Jedi makes a return to the simplicity of Star Wars, and I think that’s part of the reason why I react more strongly to it than The Empire Strikes Back. We’re back to the adventurous tone that makes the first film so great, with the added bonus of the mythology delved into from the previous movie. On top of that, the film climaxes in truly exciting fashion, with everything between Luke, Vader and The Emperor standing out in particular. The duel between Luke and Vader carries real weight, and the way it culminates in Vader’s redemption results in perhaps the most powerful scenes of the franchise. 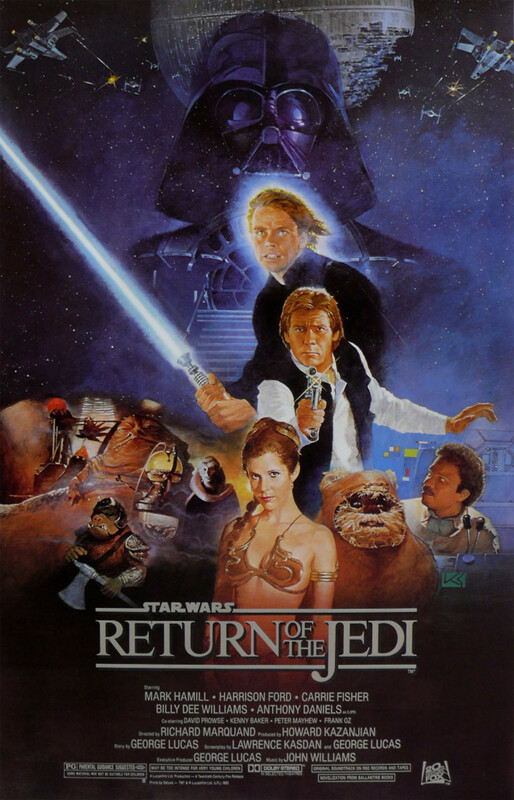 Return of the Jedi is very much in the tradition of classic blockbuster filmmaking, and serves as a strong and effective send-off to the initial Star Wars trilogy.